I've known Chris and Margaret since before they had a store. Chris is very knowledgable. The staff give good suggestions. The tap list always has something new and/or interesting. You can find hidden gems in the bottle shop. This place is great! Support this small business with a great selection of beer, cider and specialty liquors. Why go anywhere else? Excellent little bottle shop and tap room. Broad and great selections worldwide. Expert advice from team. Perfect for loading up the Beer Safari suitcase. Will check out on line service soon. Online order, nice selection. Super fast shipping. Finding it easier to order beer online than trading. Will use again in future. 10/27/17 since my original review, I've probably gone to The Beer Temple 10 times. All good. 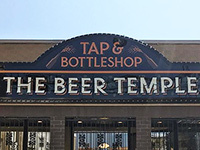 But it is time for everyone to update the reviews because 7 weeks ago, Beer Temple moved across the alley to their combined taproom and bottleshop. The taproom is very well done, pleasant. It has at least two dozen beers and ciders on tap and many more in bottles ("The Beer Bible" is the list.) Almost everything else below holds the same. But you should visit the taproom. This is 1.5 miles from home and been open for over 3 years and today is the first time I walked in. I knew the associate from another store. Big-time knowledgeable. I met the owner doing an informal tasting. I went home and went on their website. Placed an order. Impressive for a small store. I will go there again shortly. Great sour and Belgian selection. Prices are reasonable given that they are small and don't have the buying power of binnys - perhaps 50c or $1 more per bomber than the discount places, but the selection makes up for it. Best selection in the city. Not only is the inventory well thought out, it is highly combed through. I have never had a beer that was too old or past it's best by date. Nick always provides outstanding customer service and awesome recommendations every time I am in. This place is what a craft beer shop should be. Impressive. Chris Quinn has created something great. All the reviews below say enough. Truly a world class establishment run by a staff that truly strives to provide the best craft beer experience they can. Bottle shops like this will never go out of style.